The very much proficient, Mo Farah is one of the renowned names in the field of running.He is a professional British runner. Born and grew up in Mogadishu, Somalia from parents Amran Farah and Muktar Farah.He has three brothers.He joined Feltham Community College. 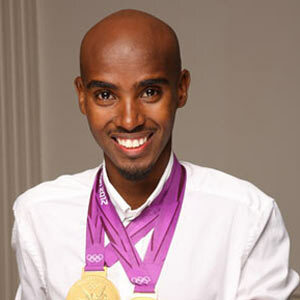 He has an accumulated net worth of 5 million dollars.Mo is also a philanthropist and follows Muslim religion.His birth name is Mohamed Mukhtar Jama Farah. Mo is married to his longtime girlfriend Tania Nell.They are blessed with two daughters Aisha and Amani and a son Hussein. British Athletics Writers’ Association Award, UK Aviva Athletics Award, London Youth Games Hall of Fame, European Athlete of the year, BBC Sports Personality of the year award. Christiano Ronaldo is a world renowned Portugese professional footballer who began his career in 2002 playing for Sporting CP and is currently playing for English Club Real Madrid and for his Portugese National Team as a forward. Samuel Etoo is a professional football player of Cameroon national football team. He plays as a striker. He is mainly known for playing in FC Barcelona from 2004 till 2009. He also have played for English Premier League club Chelsea. Stephone Anthony is an American football linebacker who plays for the Miami Dolphins of the National Football League(NFL). Previously, he played college football at Clemson. A famous professional basketball player who used to play for Westchester Wildfire of the U.S Basketball League but now he is retired from his gaming career.